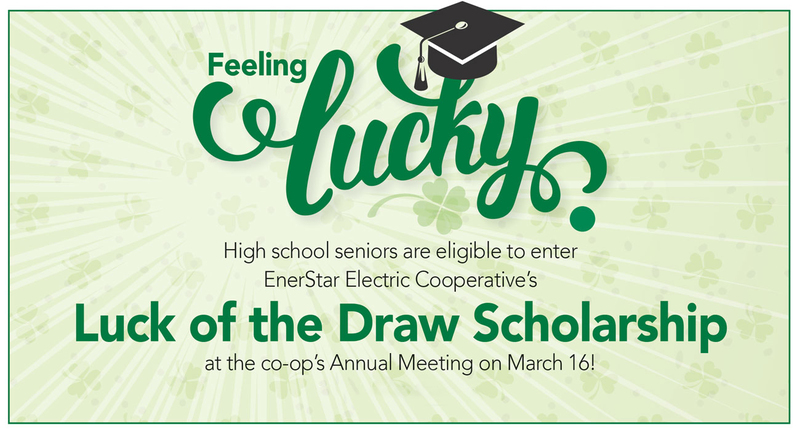 At the upcoming EnerStar Electric Cooperative annual meeting on March 16, three lucky high school seniors could each win a $250 scholarship! It’s easy to qualify. Just come to the meeting with a parent and enter your name into the drawing by 9:15 a.m. and you could win! See below for all the details! The scholarship recipient must be a graduating high school senior whose parents/legal guardians are active members of EnerStar Electric Cooperative. The child must reside in the home where EnerStar provides the electricity. High school seniors and non-traditional students are allowed to apply. Non-traditional students include those attending private, parochial or home school. Applicants should register for the scholarship drawing at the EnerStar Annual Meeting of Members on Saturday, March 16, 2019 between 7:30 a.m. and 9:15 a.m. at Crestwood School. Three (3) scholarships each totaling $250 will be awarded during the meeting. Applicant and a parent must be present at the meeting. Scholarship payout: Students receiving a scholarship are responsible to provide a copy of their class registration for the first quarter/semester within 30 days of receipt. Once correct documentation has been received and paperwork has been verified, checks will be made payable to the school and sent to the student/parent home address on record with EnerStar. Information can be sent to: Scholarship Program, EnerStar Electric Cooperative, 11597 IL Highway 1, Paris, IL 61944.